DapperLads - Toddler Argyle Sweater Vest & Socks - Red - English & Full Dress Vests - English vests with ruche ties. Rugged Butts formal vests, argyle golf sweater vests with argyle knee socks. A 2-pc set. 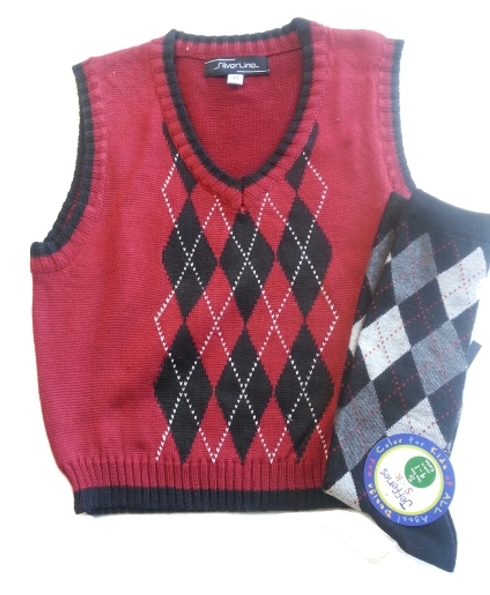 A classic argyle diamond sweater vest in red and black. From Silverline. Cotton - poly blend. Machine wash. Runs small. Paired with cotton argyle knee socks in a gray and black. A great golf look on or off the course for pictures and dressy casual occasions, too. Machine wash cold and dry on low recommended. Pair with the black-watch plaid pants and a button down shirt to make a complete look - or the black vintage knicker set. See complete your look optional items below.